Join us for an opening act hosted by drag queen Jaylene Tyme featuring the talents of burlesque dancer RainbowGlitz and more! 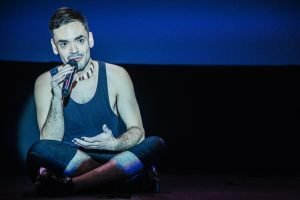 Starring Anthony Hudson – the human vessel for Portland’s premiere drag clown Carla Rossi – LOOKING FOR TIGER LILY utilizes song, dance, drag, and video to put a queer spin on the ancestral tradition of storytelling. Asking what it means for a queer mixed Native person to experience their heritage through white normative culture as they recount growing up watching the 1960 production of “Peter Pan” featuring Sondra Lee’s blonde, blue-eyed “Indian Princess” Tiger Lily, Anthony (and Carla) draw from a songbook stretching across Disney’s “Pocahontas” to Cher’s “Half-Breed.” Not just autobiography, LOOKING FOR TIGER LILY is a coming-of-age story that's more than cowboys versus Indians.